Office Manager Debbie Culbertson has worked at Holmes Veterinary Hospital since 1987. She also fulfills duties as a treatment technician, x-ray technician and surgical assistant. She is married and has two grown children and four grandchildren. Debbie enjoys shopping, music and movies and is an avid reader of theology texts. She has a rescue dog named Buddy and several outside pets. Surgery Technician Laura Haupfear has worked at Holmes Veterinary Hospital since 1989. An elite athlete, Laura runs marathons and triathlons and in 2009, completed a lifelong dream by completing the Ironman Louisville. 140.6 miles in 12 hours 38 minutes and 12 seconds! She is married and has three canine children: a border collie Gunner who runs with her and rescue dog named Tippy. Gina B. Crane has worked at Holmes Veterinary Hospital since 1996. Gina performs a wide variety of duties from technician to acting as receptionist to behind-the-scenes duties. She is married and lives in Barksdale with her husband and two sons. Camping and crafts are some of the things Gina enjoys. She also likes spending time with her sons and her nieces. 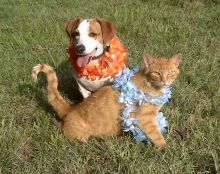 Gina has a Papillion named Max, a spaniel-mix named Copper and a cat named Romeo. She sometimes volunteers to bottle raise baby kittens. 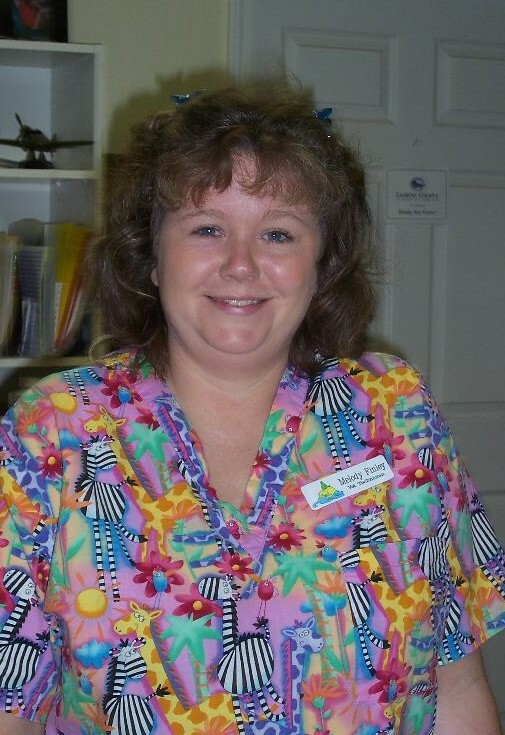 Melody S. Finley has worked at Holmes Veterinary Hospital since 1996. She enjoys horseback riding and camping with her family. She is married and has two daughters. Melody lives on a small farm with a mixed terrier named Clayton and a Pekingese named Shu-Shu as well as horses, goats, a potbellied pig named Muffett, rabbits, chickens, cats and tarantulas. Assistant Vicky McClain has worked at Holmes Veterinary Hospital since 2004. Vicky is enjoying her second adulthood here, having retired from Solutia. She is married and enjoys camping and recently fulfilled a lifelong dream by going on a cruise. Vicky has two dogs, poodles Pooh Bear and Tiny and chihuahua-mix Fancy. Bookkeeper Madge Byrd has worked at Holmes Veterinary Hospital since 1991. Madge is married and has two grown daughters and is very active in her Church and her community. She enjoys spending time with her five grandchildren. Kennel manager Debra Bunch has several dogs including mixed breeds, shihtzus and Deuce, a once-wayward but now reformed Siberian huskey. Debra is the hardy soul who makes it in to care for hospitalized and boarding pets during snow and ice storms or whatever else mother nature throws our way.